I don’t remember the last time I went out on Valentine’s Day. It’s been a good few years, and me and Husband have never been out for a romantic valentines meal. I mean, we might have took the kids for a Nando’s lunch or something at some point, but that’s about it. We don’t do gifts either. We do mark the day, with a card and husband will cook us a nice meal at home. Usually a steak and a nice bottle of wine. We might also buy a new film to watch. So it’s special to us. But not in a big overdone romancing way. I do however like an excuse to bake something. Any excuse really, Valentine’s, Christmas, Easter, Tuesdays. More so if it’s something chocolate. 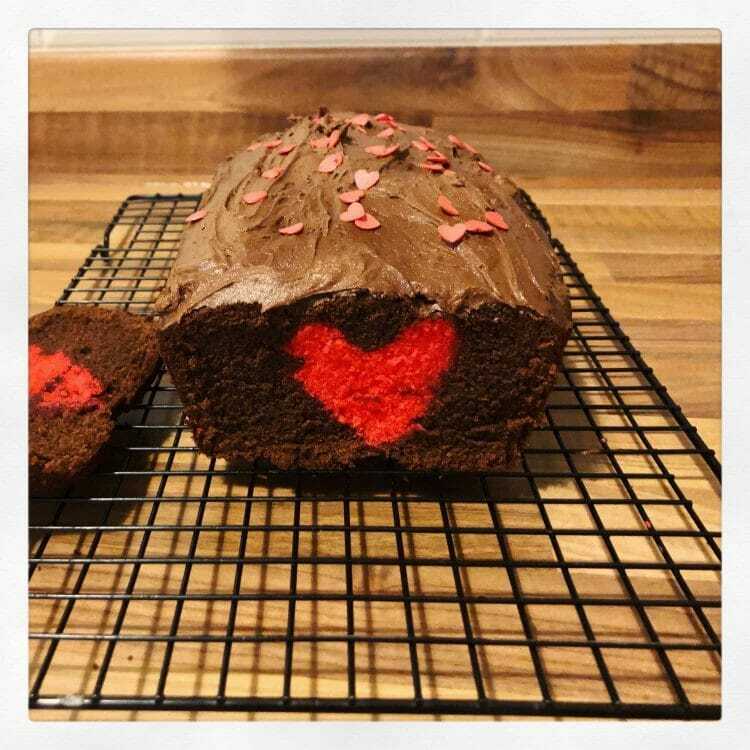 Last year I made valentines brownies and cookies, this year I went for this Chocolate Heart Surprise Cake. Not going to lie, my first Chocolate Surprise Heart Cake didn’t even make it into the oven. The middle bit just didn’t work at all. I’d tried to use a regular red food colouring from Asda, and it just came out brown. Like cake. I’d also failed to make enough batter, so there wasn’t enough heart to support itself in the centre. Nor was there enough chocolate to cover even the pitiful amount of heart. We salvaged the chocolate batter and made cupcakes. Roses are Red…hearts are brown?! To get a bright heart centre, that still tastes good, you need a better food colour. Eventually, I settled on this red gel, which worked pretty well. I use a 9inch by 4 inch cake tin, and a heart cutter that’s around 2-3 inches tall. You can make it work with whatever you’ve got though, just make more or less batter. Save any leftovers for cupcakes. 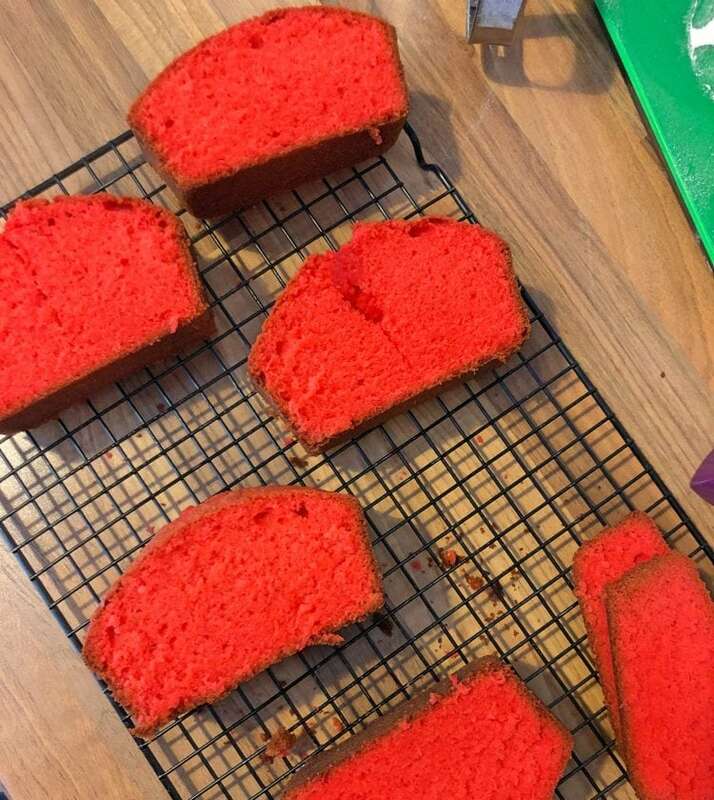 I really want to say save the cut offs of the red for cake pops or something equally cook, but we totally ate ours as they were! 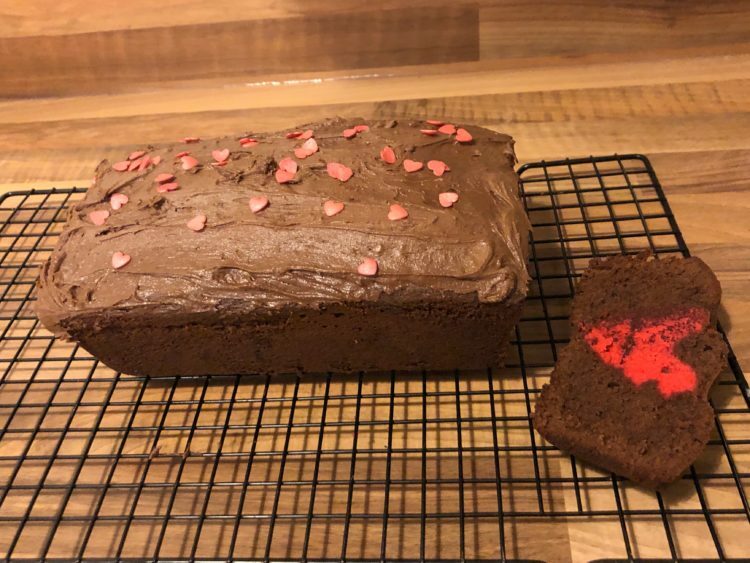 I top my Chocolate Heart Surprise Cake with a simple chocolate buttercream, and some little heart sprinkles I got from Amazon for about £2. I kept the heart plan, and the rest chocolate, but you could add some raspberries to your heart if you wanted to give it some extra flavour. I also only add quite a thin layer of buttercream. If you want more, double the recipe. If there’s any left, it freezes really well in an airproof container. This is one of those bakes that looks a lot more complicated than it is. But, it’s really not. All you need is a freezer, a heart cookie cutter and some patience. I struggle with the patience part, but the longer that you leave your hearts to freeze, the better it will all cook together. You need at least 2 hours I’d say. 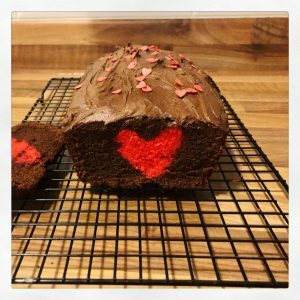 A fabulously chocolatey Valentine’s treat. 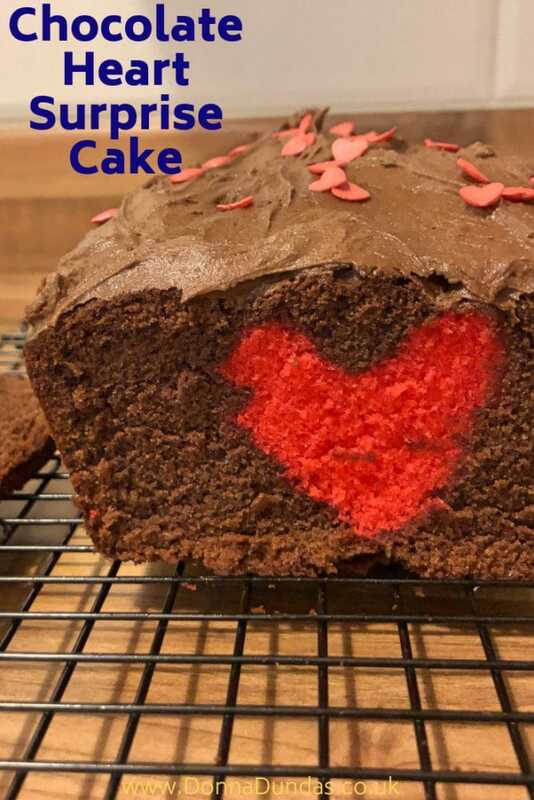 You also need a loaf tin (mine is 9” x 4”) and a deep heart cookie cutter If you want to stab the chocolate batter to check to see if it’s cooked, be sure to only insert the skewer into the chocolate and not the heart, or it might bleed.